This is, without a doubt, the easiest, fastest and best way to remove magazine base plates from your standard Glock Magazines. We like to say that it is as easy as 1, 2, 3! Watch the video now! 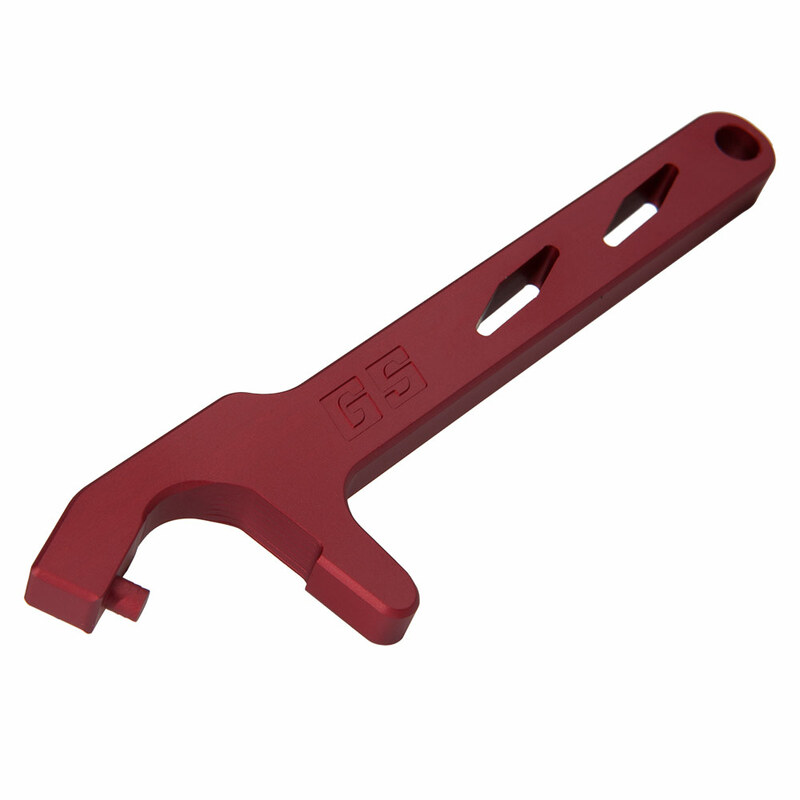 The M.D.T., Magazine Disassembly Tool, is machined in the USA from billet aluminum and is a multipurpose tool that also doubles as a bottle opener! Of course, that was a secondary use incorporated by Lenny Magill for fun. The main purpose is to assist you in removing the base plate from your Glock magazines. We like to say that it is as easy as 1, 2, 3! 1) Grasp the magazine body with one hand. Insert post into the hole at the bottom of the magazine base plate with the other hand. 2) Place thumb on top of magazine base plate to capture spring. Keep magazine pointed in a safe direction at all times. 3) Rotate wrist down. Make sure your thumb stops the magazine spring from launching out of the magazine body. Continue to push the base plate off the magazine body. The MDT makes it very easy to remove the magazine base plate. Always wear safety glasses when using the MDT to remove the magazine base plate. Always keep the magazine pointed away from your face and away from others standing close by. Always be prepared to capture the spring with your thumb as you slide the magazine base plate off of the magazine body. And, when all the guns are put away and you have time to relax, the M.D.T. will also double as a nifty bottle opener! Either way, you'll love the M.D.T. I purchased this when it first came out. It works great. I have different size magazines and even being not as strong at my age, it worked great on the standard size sub-compact magazines. I strongly suggest you purchase this item if you have any thoughts whatsoever about cleaning Glock magazines. Another Incredible Product from Magill's Glockstore. I bought this tool with a Glock 42 Plus 1 Mag Extension. Makes disassembling the mags extremely easy. Great Invention!! This by far is the best tool for changing Glock Base Plates . No more frustration changing out base plates . I would say it took less than a minute to change one out . This is a must for anyone's tool box . As easy as 1-3 "4-5-6 and sometimes 7"
45 minutes and a little swearing, finally got them on. Yes, it works better than nothing. but these damn plates don't just slide on with ease. you must work on it, an No, I'm not slow. A Law Enforcement Officer for 40 years and, Im not a Captain. Yes, I can walk and chew gum and did so while installing Vickers base plates, they're great base plates!! As far as the tool, goes. yes, it does work. I ordered this tool on a Saturday and had it in my hands in GA the following Wednesday. It is fantastic it opened my G21 45 ACP mag is 2 seconds with no mag damage at all. Nice product . It is not cheap because good quality AMERICAN MADE TOOLS ARE NOT CHEAP THEY LAST. It says in the description of the tool that it works to remove base plates from your standard glock magazines. Do not forget that. Because if you install a different base plate (ie the Pearce grip extenders) the round nob on this tool will be too big to fit inside the Pearce base plate hole. But, it works well for what its designed for. I purchased this tool and just tried it. Wow, Lenny this is an awesome tool. I'm my departments Firearms Instructor, with over 35 years on the job, a Glock Armorer. I'm ordering another one for my range tool box and this one is on my work bench. My partner Pete, also a Firearms Instructor, Glock Armorer too, I'm ordering him one too. Anyone having a problem with this tool, watch the video Lenny has posted. Yes it is that easy to use. I was not racing anyone, but this tool is so easy and fast to get the magazine base plate off without making the hole at the bottom of the magazine base plate into the shape of an EGG. Any Glock Armorers out there you need this tool, you need two. Lenny Thanks for a great tool, this is an awesome tool!!!!!!! Wish I had purchased one when Lenny first made them available in GS. Not cheap but very well made and finished too. Magazine Floor Plate removal now a breeze! No scratching, digging, out of round plate egg holes etc. Yes, you do have to put a floor plate back on, this is a removal tool so when removed and ready to replace you line your floor plate , hard surface with a cloth and push, a little snap and you are good to go. This tool makes removal so easy. The hardest part is looking for the hidden base plate if I forgot to prevent it from rocketing off. After that, I apply just a bit of grease on the edges to make it even easier to remove, and re-install (as snap, literally) the next time. Great tool. And I got it from the Glock Store. Sometimes you come across a tool that is so simple, yet so effective and easy you wish you would have thought of that. This tool is exactly that for any magazine maintenance. WHY DIDN'T I BUY THIS BEFORE?!?!?!? I discovered this tool and although it is "slightly pricey" - the quality is absolutely 1st rate!! The tool will last a lifetime - absolutely no regrets in purchasing this Glock Store product!!!! Made removing the baseplate off of a G43 magazine a breeze! Perfect! If you have even one Glock mag, get this tool. For one thing, the task of cleaning your mag(s) of dust etc. is now easy.